Two of the most important and expensive investments in your home are your carpet and your mattress. But there are hidden germs lurking in two of the places you and your family use the most. That is why mattress cleaning is important. The longer dirt is allowed to build up on the fabric, the greater the damage to the fabric because it's been in contact with the dirt. Did you know that the average mattress can double its weight in 10 years? Double, do you know how much sweat, dirt, and fluids it would take to double the weight of a mattress? The mattress is, without a doubt, the dirtiest object we have close contact with. We spend one third of our lives sleeping on mattresses that can become extremely soiled and as such, potentially dangerous to health. This applies equally to a mattress that is only a few months old as it does to a mattress several years old. House dust mites are not restricted to the mattress; their excrement can be found in carpets, rugs, upholstered furniture, window curtains and soft toys. We are equipped to clean and sanitize these areas as well.Mattresses and pillows are the ideal environment for house dust mites. Whether you suffer from asthma and allergies or not, sanitizing the bedroom and having your mattress cleaned will dramatically reduce the amount of harmful bacteria and mites which will improve your quality of sleep. 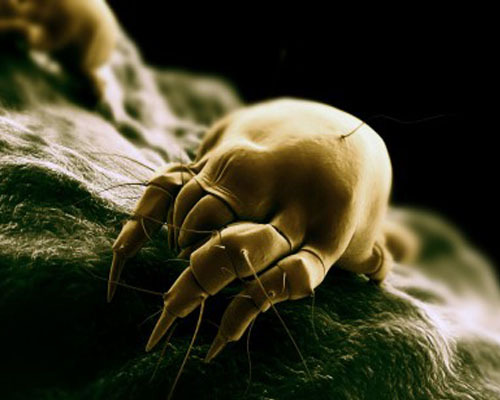 Dust mites are the number one cause of allergic reactions in the home. If you find yourself waking up with a stuffy nose and sneezing every morning, it might be time for mattress cleaning.